Changes in technology have impacted the way all of us live, learn and work. Millennials are different from other generations—but probably not as different as L&D and talent leaders have been led to believe. Millennials are the first true “digital natives,” and because of this, they are often associated with driving new work practices and expectations. However, it is actually the ubiquity of technology, the accelerated pace of work and our consumer experiences that are driving new work practices, not millennials. Rather than focusing solely on millennials, develop a learning and development strategy focused on meeting the needs of the modern learner—and watch your programs become more effective in engaging employees to deliver business impact. 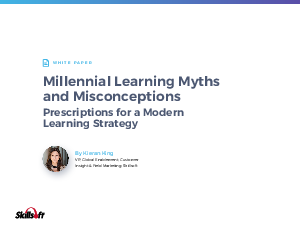 Download “Millennial Learning Myths and Misconceptions Prescriptions for a Modern Learning Strategy” for tips for enabling modern learning at your organization.